Historically amazing – presently, scenically challenged. A pessimistic beginning to a special place that Russ especially wanted to visit, but weather and road conditions have been against us. With unseasonable rain and road closures, in whatever direction we decide to travel, we are tending to look on the gloomy side. 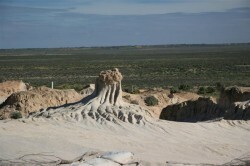 Arrived at Mungo, part of the Willandra Lakes region, now listed as a World Heritage Area in 1981. It was hard to imagine the entire region covered in lakes, 50,000 years ago. 17,000 years ago the lakes dried, leaving flat lake beds, surrounded by dunes, eroding with the weather, but attracting tourists. 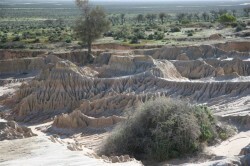 They call these surrounding areas of Lake Mungo, the Walls of China. 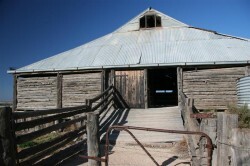 Used as a sheep station since the 1800s the shearing shed is a typical structure of the times with slatted floor. 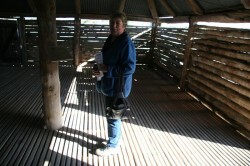 Lynton will remember us sleeping on a similar floor when camping at the family farm at Wallacedale. We also saw a lifelike model of Ziggy (Deens recently departed cat was called Ziggy), Zygomaturus trilobus, similar size to a hippo, which used to roam the lakes area. Evidence of life is present from at least 40,000-50,000 years ago, where aboriginal people camped and fished along the shores. 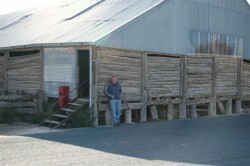 Camping is available in the Main Camp, fires accepted. Belah Camp is another spot for camping, but no wood allowed. Travelled to Lake Menindee, because of threatening weather. They close the roads after rain and you can be stuck there for days. With black clouds in every direction, we travelled over some scary roads, with mud, sounding like shrapnel, as it flew up from the road and off the tyres, underneath the car. 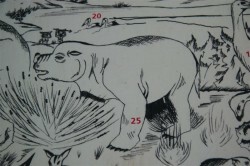 We were tired and pleased to get to Lake Menindee.